Thereupon, the Buddha Śākyamuni emitted a ray of light from his topknot (uṣṇīṣa), the mark of a great person, and also from the tuft of white hair between his eyebrows (ūrṇā), thus illuminating all the buddha worlds in the east equal to the sands of one hundred and eight myriads of koṭis of nayutas of Ganges Rivers. Beyond this number of worlds was the buddha world called Vairocanaraśmipratimaṇḍitā. 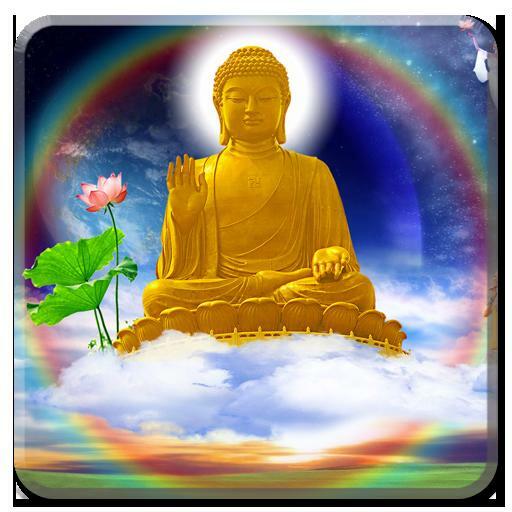 In that world was the buddha named Kamaladala Vimalanakṣatrarājasaṃkusumitābhijna, a Tathāgata, Arhat, Completely Enlightened, Perfect in Knowledge and Conduct, Well-Departed, Knower of the World, Unsurpassed, Tamer of Humans, Teacher of Devas and Humans, Buddha, Bhagavat. He was respectfully surrounded by a great assembly of countless, innumerable bodhisattvas, and he expounded his teaching for them. The ray of light emitted from the tuft of white hair between the eyebrows of Śākyamuni Buddha illuminated that entire world. Being a Ray of Illumination—thus illuminating countless dharma-realms and its inhabitants. As a direct-sign that alerts other Buddhas and Bodhisattvas in the ten-directions that something of great significance is about to unfold in the saha-world (our own world) as spiritually-overseen by Śākyamuni Buddha. 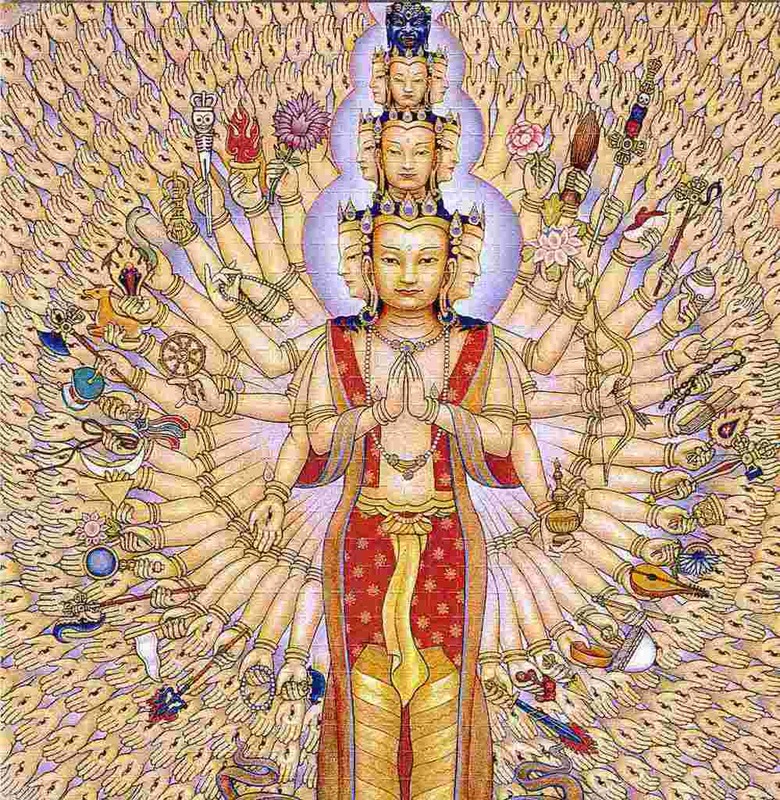 Thereupon Bodhisattva Gadgadasvara disappeared from his world and arrived together with eighty-four thousand bodhisattvas. In the worlds through which he passed, the land quaked in six ways, seven-jeweled lotus flowers rained everywhere, and hundreds of thousands of heavenly musical instruments sounded spontaneously without being played. The eyes of this bodhisattva were as large as blue lotus leaves. Even if hundreds of thousands of myriads of moons were gathered together they would not exceed the beauty of his countenance. His body was pure gold in color, adorned with immeasurable hundreds of thousands of merits, radiant with virtuous dignity, and brilliantly illuminated like the adamantine body of the god Nārāyaṇa. Having entered the seven-jeweled platform and ascended into the air, he flew above the earth at a height of seven tāla trees. Surrounded by respectful bodhisattvas, he arrived at Mount Gṛdhrakūṭa in this sahā world and descended from the seven-jeweled terrace. He came before the Buddha Śākyamuni with a necklace worth hundreds of thousands in his hand and bowed until his forehead reached the Buddha’s feet. 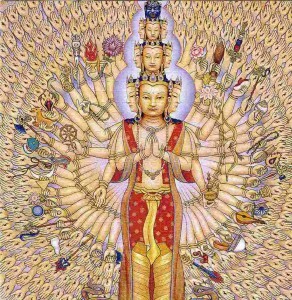 …this bodhisattva manifests himself in various bodies. He has thus taught this sutra in many places for the sake of the sentient beings. Sometimes he has appeared in the form of Brahma. Sometimes he has appeared in the form of Śakra. Sometimes he has appeared in the form of Īśvara. Sometimes he has appeared in the form of Maheśvara. Sometimes he has appeared in the form of the great commander of the devas. Sometimes he has appeared in the form of Vaiśravaṇa. Sometimes he has appeared in the form of a noble emperor. Sometimes he has appeared in the form of a minor king. Sometimes he has appeared in the form of a wealthy man. Sometimes he has appeared in the form of a householder. Sometimes he has appeared in the form of a state official. Sometimes he has appeared in the form of a brahman. Sometimes he has appeared in the form of a monk, nun, layman, or laywoman. Sometimes he has appeared in the form of the wife of a wealthy man or a householder. Sometimes he has appeared in the form of the wife of a state official. Sometimes he has appeared in the form of the wife of a brahman. Sometimes he has appeared in the form of a boy or a girl. Sometimes he has appeared in the form of a human, or a nonhuman such as a deva, nāga, yakṣa, gandharva, asura, garuḍa, kiṃnara, or maho raga. I love this chapter. It literally vibrates with the immense Compassionate-Powers of Bodhisattvas. This little visitation to our own saha-world by this Maha-Bodhisattva Wonderful Voice is just one instance in which both Buddhas and bodhisattvas travel to and fro different Buddha-fields, sharing their Transcendent and Noble Wisdom; offering to help one another and thus making powerful, combined efforts to ease the suffering of sentient beings. Our own Śākyamuni Buddha likewise travels to other Buddha-fields and offers his own extraordinary help in many diverse settings. There’s something else to be learned from all this—and that is RIGHT HERE, RIGHT NOW, we also are being visited and comforted and inspired by countless Buddhas and Bodhisattvas, who lovingly expound the Buddhadharma and who always inspires our spirit to seek the Highest Good in all we do. We are never alone. This entry was posted in The Lotus Sutra and tagged Adorned with Pure Light, Bodhisattva, Bodhisattva Gadgadasvara, Buddha's Ray of Light, form, Wonderful Voice. Bookmark the permalink.